The Young Leaders Society (YLS) Leadership Series is a set of thought-provoking seminars and discussions in a small-scale setting that seek to encourage purpose-driven leadership in the Santa Barbara community. Offered to YLS members and the community, the Leadership Series features local community leaders who share about their personal career journey, leadership advice and guidance for young professionals, as well as their philanthropic and community involvement. Each event features a different local leader and offers the chance for guests to interact with the speaker and network with like-minded attendees. 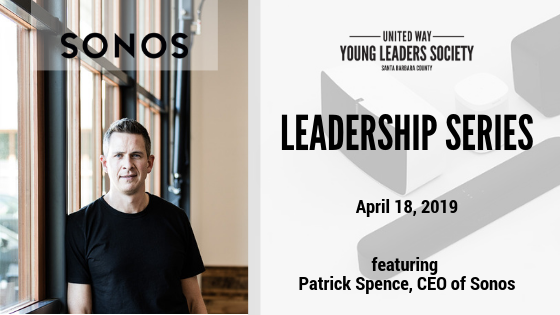 Speaker Bio: Patrick Spence is the Chief Executive Officer and serves on the Board of Directors for Sonos. Patrick joined Sonos as Chief Commercial Officer in 2012. He has played a central role in the development and launch of some of the company’s most successful products. Patrick has also led the company’s expansion into new territories including China, France, Australia, and Mexico. Prior to joining Sonos, Patrick spent over 14 years at RIM/BlackBerry in a variety of roles, including overseeing sales channels and country marketing operations in various regions including North America, Asia Pacific, Europe, the Middle East and Africa, ultimately becoming the Executive Vice President of Sales & Marketing. During Patrick’s time at RIM/Blackberry, the company grew from $50 million in revenue to more than $20 billion, and from 150 people to more than 17,000. In 2007, Patrick was named one of Canada’s Top 40 under 40, a national program to celebrate leaders of today and tomorrow and to honor Canadians who have reached a significant level of success. Patrick holds an Honors Degree in Business and Administration from the Richard Ivey School of Business at the University of Western Ontario in Canada. Click here for pictures of previous events.